The picture seems just right for a guy who fell in love with the space program as a kid growing up in the 1960's. Taken by Joseph Minafra Of Lockheed Martin, there's a smiling yours truly holding a moon rock picked up by one of the astronauts during Apollo 16. Joseph and another colleague from Lockheed, were in Atwater on June 10 for the twentieth anniversary celebration of the Challenger Learning Center on the grounds of the former Castle Air Force Base. Growing up during the formative years of America's race to the moon, I remember most of the rocket launches. All were televised by the three networks in these pre-cable saturation days. Whether you liked it or not, a NASA launch was the only thing on. But I liked it. I was amazed by the firepower of those rockets. I took in with great interest the grainy video of John Glenn and his fellow astronauts. The Mercury program started things for US manned space flight. Gemini followed, and it would lead into the Apollo program. It seemed as thought I watched every launch. The television anchormen and reporters who covered the launches were filled with the sense of excitement that this was a really special, truly American, accomplishment. Back in the 1960’s, no other country, save for the Soviet Union, was even coming close to achieving what the United States was accomplishing with the space program. The enthusiasm endured even as the nation continued to get mired down in the tragedy of Vietnam. But a setback in 1967 would but the brakes on the program at least for a little while. I was away with my dad and brother at a winter camp the night we heard on the radio that Apollo 1 had experienced a fire that killed three astronauts during a systems test. I was nine years old and like many Americans, I felt that our race to the moon might be stalled for the rest of the decade. But the Apollo program returned, and soon our focus was back on the moon and doing that in a safer manner. I remember the Life magazine cover of Apollo 8 going around the moon and sending back a picture of the big blue and white marble that was Earth at Christmas time in 1968. I started a scrapbook as the nation, and the world, anxiously awaited the launch of Apollo 11. Two more missions would push the envelope even further as the world waited for the big one. The astronaut team of Neil Armstrong, Buzz Aldrin, and Ed Collins were our heroes as that “small step for man… giant leap for mankind” took place in July 1969. Their mission was a success. They brought back the incredible story of an unimaginable adventure. And they brought back moon rocks. Over the next few years, five more missions (Apollo 13 did not land on the moon) to the lunar surface would create more fascinating stories, and more rocks. There's a scene in the movie Apollo 13 where the stranded astronauts momentarily question why their spacecraft calculations seem to be off by a few hundred pounds. Two astronauts look at each other with one saying, "Rocks." The calculations were based on a returning spacecraft that would have included lunar samples. I guess that's why the moon rock on display at the Challenger Learning Center really hit home for me. 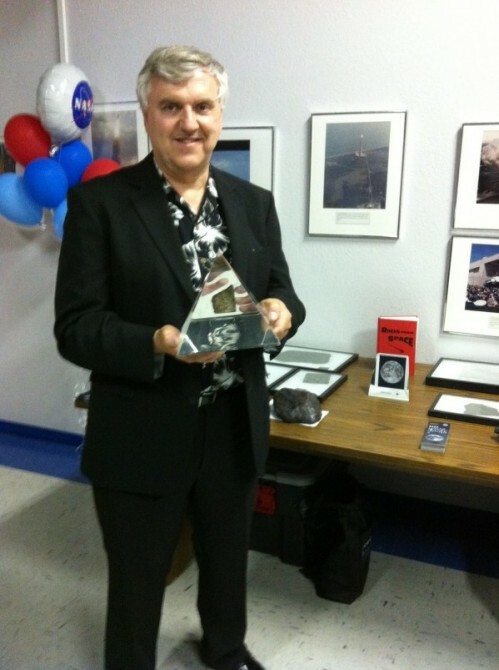 Here was a piece of the moon, encased in lucite, but a specimen from our great adventure into space. I could hold it, and smile with it as the picture was taken. It completes the scrapbook I started as a kid. Over the years, I met several astronauts in my travels as a space reporter in Huntsville, Alabama in the early 1980’s. In the 1990’s, I met Jim Lovell and Fred Haise, the two surviving members of the famous Apollo 13 mission that had to return from space after an explosion nearly lost the spacecraft. The pair was reunited at a conference I attended in upstate New York. Meeting these modern day explorers was nothing short of a dream come true for this boy who loved the space program. But seeing the moon rock, something that actually came back from America's journey into the unknown, was a very special moment in my life. Ever since Apollo ended, there has been debate over why the United States ended manned lunar exploration. When the space shuttle program ends later this year, the discussion will continue over why our nation is backing away from manned space flight. For this one special night in Atwater, California, there was no debate. There was no discussion over our space budget priorities. For this one night, this little boy who grew up never losing faith in American ingenuity, the moon rock brought it all home.